A far-fetched idea carried out smoothly and with surprising charm. Victimized by pills and alcohol, Marilyn Monroe thinks her longtime lover, Senator Kennedy, now President Kennedy, wants to dump Jackie and have Marilyn double as First Lady and masseuse for Jack's bad back. Marilyn calls Hedda Hopper with this marital exclusive, then Louella Parsons, and sets up a press conference for the big engagement announcement. But Marilyn is wired in more ways than one. Her phone is bugged; her housekeeper is on Attorney General Bobby Kennedy's payroll, as are her doctors; and every move she makes or syllable she utters is recorded. To save the presidency, Bobby stages Marilyn's death, a dead prostitute look-alike is switched for Marilyn's body, and the drugged actress herself is heisted off to Pueblo, Colorado, and kept incommunicado in the wilds until she escapes one day by drugging her captors with heavily Valiumized vegetable soup. Later, following injuries in a train wreck, her face is slightly reconstructed and she goes auburn as well. Hiding out in Manhattan with a new identity, she becomes a waitress, a ditzy but beloved clerk at Doubleday's big Fifth Avenue store, an Off-Off-Broadway actress, and Village chanteuse of existentialized supper-club ditties. Deglamorized, Marilyn proves her worth, meanwhile wondering if the now-assassinated president had had a hand in her kidnapping. First-novelist Staggs uses the public Marilyn mask as his basic Marilyn, a soft-voiced innocent who has been invaded by all her roles and who responds to events accordingly as Cherie, Sugar Kane, Roslyn Tabor and other famed characters she played. 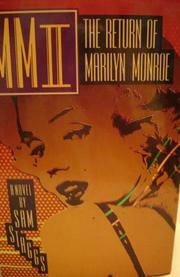 By all reports, the real Marilyn swore like a trouper and had an edge nowhere heard in these pages. Even so, within the limits he sets himself, Staggs pulls off triumphant Marilyn sound-alike dialogue and at last--himself clearly having fallen in love with his character--charms away all the reader's reserve with Marilyn's own voice.